Students participated in crafting window decorations for homecoming Wednesday, October 3, 2012 at Cary-Grove High School in Cary. Homecoming festivities will culminate in parades Saturday morning before a varsity home football game against Huntley at 1PM. Mike Greene - mgreene@shawmedia.com Sophomore Emily McCratic, 15, focuses while writing her classes graduation year during window decorations for homecoming Wednesday, October 3, 2012 at Cary-Grove High School in Cary. Homecoming festivities will culminate in parades Saturday morning before a varsity home football game against Huntley at 1PM. 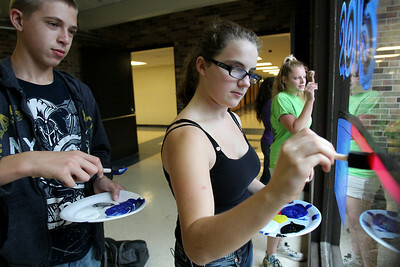 Mike Greene - mgreene@shawmedia.com Sophomore Nick Schoenhoft, 15, helps classmate Liz Beatty, also 15, while painting during window decorations for homecoming Wednesday, October 3, 2012 at Cary-Grove High School in Cary. Homecoming festivities will culminate in parades Saturday morning before a varsity home football game against Huntley at 1PM. Mike Greene - mgreene@shawmedia.com Sophomore Jordyn Ladewig, 15, works on a banner during window decorations for homecoming Wednesday, October 3, 2012 at Cary-Grove High School in Cary. Homecoming festivities will culminate in parades Saturday morning before a varsity home football game against Huntley at 1PM. 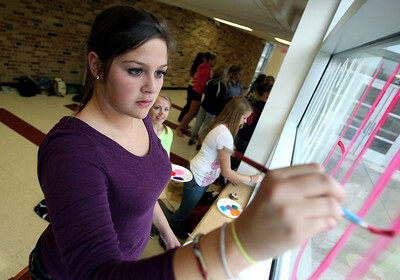 Mike Greene - mgreene@shawmedia.com Sophomore Emily Kuperman, 15, works on a frosh/soph cheer window during window decorations for homecoming Wednesday, October 3, 2012 at Cary-Grove High School in Cary. Homecoming festivities will culminate in parades Saturday morning before a varsity home football game against Huntley at 1PM. Mike Greene - mgreene@shawmedia.com Juniors Lisa Semro (left), 16, and Jamie Deering, 16, laugh while working on a window for varsity softball during window decorations for homecoming Wednesday, October 3, 2012 at Cary-Grove High School in Cary. Homecoming festivities will culminate in parades Saturday morning before a varsity home football game against Huntley at 1PM. Mike Greene - mgreene@shawmedia.com Sophomore Jimmy Vitullo, 15, puts a label over an bald eagle while working on a window for the business club during window decorations for homecoming Wednesday, October 3, 2012 at Cary-Grove High School in Cary. Homecoming festivities will culminate in parades Saturday morning before a varsity home football game against Huntley at 1PM. Mike Greene - mgreene@shawmedia.com Junior Anna Ivarson, 16, works on a window for the student newspaper during window decorations for homecoming Wednesday, October 3, 2012 at Cary-Grove High School in Cary. Homecoming festivities will culminate in parades Saturday morning before a varsity home football game against Huntley at 1PM. 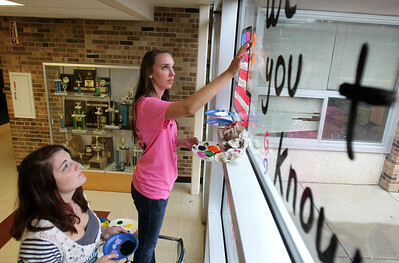 Mike Greene - mgreene@shawmedia.com Juniors Mary Stoppenbach (left), 17, and Rebekah West, 16, work on a junior class window during window decorations for homecoming Wednesday, October 3, 2012 at Cary-Grove High School in Cary. Homecoming festivities will culminate in parades Saturday morning before a varsity home football game against Huntley at 1PM. Mike Greene - mgreene@shawmedia.com Sophomore Derek Holtz, 15, works on a window for scholastic bowl during window decorations for homecoming Wednesday, October 3, 2012 at Cary-Grove High School in Cary. Homecoming festivities will culminate in parades Saturday morning before a varsity home football game against Huntley at 1PM. Mike Greene - mgreene@shawmedia.com Sophomore Chris Michols (right), 15, watches as classmate Jimmy Vitullo, 15 works on a banner during window decorations for homecoming Wednesday, October 3, 2012 at Cary-Grove High School in Cary. Homecoming festivities will culminate in parades Saturday morning before a varsity home football game against Huntley at 1PM. 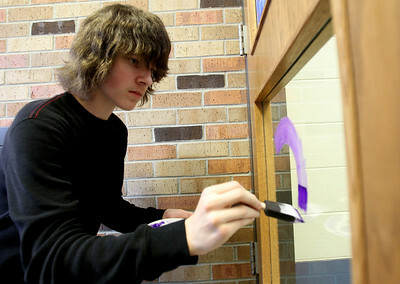 Sophomore Nick Schoenhoft, 15, helps classmate Liz Beatty, also 15, while painting during window decorations for homecoming Wednesday, October 3, 2012 at Cary-Grove High School in Cary. Homecoming festivities will culminate in parades Saturday morning before a varsity home football game against Huntley at 1PM.